I love all manner of stuffed pasta. I would say blame the Italian in me, but many cultures have some variation on the dish: momos, wontons, maultasche, manti, khinkali, modak–the list goes on and on. Many years ago the Russian in my life introduced me to pelmeni. Never having heard of pelmeni before, upon first look I thought they looked suspiciously like what I would simply call tortellini. But I was wrong, well sort of anyway. The dough on pelmeni are much thicker than a traditional tortellini dough and the meat is spiced entirely differently. Another difference? While I thought I was trying something that was a special treat (tortellini is, at least in my family–making the dough is pain) I was quickly informed that pelmeni are often the thing that Russians eat when nothing else is left in the fridge. I was recently reminded of pelmeni and wanted to make an easy vegan version of the dish. Too often, the filling in vegan dumplings of any sort contains soy–which makes the tempting parcels of dough a no-go for me. I have yet to find a really satisfying alternative which pushed me to try making a filling out of chickpeas–and I am quite happy with the result. 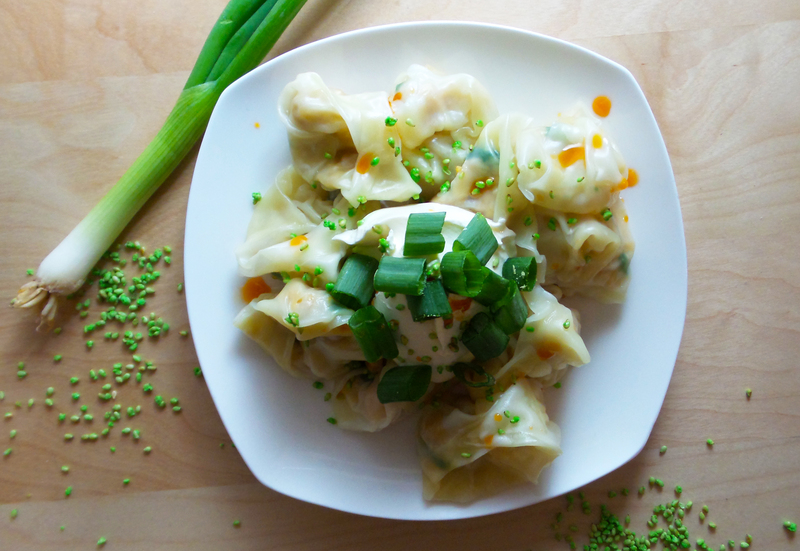 These pelmeni are hearty with just the right amount of texture and spice thanks to a generous helping of scallions, some hot sesame oil and a dash of lactose-free (or vegan) kefir. It requires no pre-cooking, you just throw the ingredients together in a bowl and mash. If you don’t have hot sesame oil on hand you can heat red chili flakes in some sesame oil, let it sit for a couple of hours and then strain it–or use some red chili flakes directly in the filling, it’s up to you. To make things easier I got rid of the arduous dough making process by using an old trick my mom taught me–buying pre-made wanton wrappers. The wrappers are dirt cheap in most Asian markets and many of them are vegan–just check out the ingredients on the back of the package. I love folding the wrappers to form the pasta, it is just the kind of repetitive task I enjoy–if you also get on a roll once you start a project like this too, you can double the recipe and freeze half to have at a later date. For the Vegan Chickpea Pelmeni: Add the chickpeas to a bowl and mash with a fork until the majority of the chickpeas are mashed–you want some chunky texture. Add the remaining ingredients and stir until well combined. Place one teaspoon of filling in the middle of a wanton wrapper. Dip your finger in a bowl of water and run it along two edges of the wrapper. Fold the wrapper into a triangle and press the edges together. Fold the tip of the triangle down about a quarter of an inch, so that it is touching the fat pocket of filling you have formed. Lastly, draw together the bottom two corners of the triangle so that they touch and press them together, using a little bit of water (if you need a visual, think of bringing the two corners together so that they look like arms making a hugging motion). Repeat until you have used up your filling. At this point you can either freeze your pelmeni in a ziplock bag or make them right away. To cook the pelmeni, bring a pot of water to boil on high heat. Add the pelmeni and reduce the heat to medium-high. Once the pelmeni float to the surface of the water, cook for three minutes. Remove from the water with a slotted spoon. To serve, top with anything you like–here I have used some vegan sour cream, scallions, wasabi sesame seeds and more hot sesame oil. Makes 30 pelmeni, about 2 servings. This entry was posted in Mains and tagged chickpea, dinner, pelmini, scallion, soy-free, spicy, tortellini, vegan, vegetarian, wanton. Bookmark the permalink. ” …bringing the two corners together so they look like arms hugging”.LOVE that! These look delicious– especially with those wasabi sesame seeds on top.